Can a Litter of Puppies Have Different Dads? If you have been lucky enough to be a caretaker of a female dog and her newborn puppies, you might have noticed that the puppies have wildly different physical characteristics. The differences may merely be related to color or other nominal traits, while other differences may be breeds apart! One litter of puppies may very well have different fathers, especially when female dogs are strays or are unsupervised by a human caretaker. This occurrence is called superfecundation, and often results in a premature “runt” who requires special attention. Pregnancy in dogs has a gestation period of 58 to 68 days long, meaning the average length is 63 days. Within the first two to three weeks of the pregnancy, the female dog can release multiple eggs, and each male who mates with her during this period of time has the potential of fertilizing one of these eggs. If an unsterilized female dog is unsupervised or a stray, it is probable that more than one male will father a puppy in the same litter. Unfortunately, the puppies who were conceived in the latter part of the ovulation window will be born at the same time as the puppies who were first conceived. What this means is that one or some of the puppies will be up to three weeks premature. Hence, this is often the reason why a tiny and frail “runt” will be born. While caring for a mother and her puppies is a rewarding experience, it is also a very distressing part of animal rescue. The runt of the litter, whose health is impacted by its premature birth, unquestionably has a much lower chance of survival. This is one of the many reasons why animal rescuers are incredibly unwavering about their position on spaying and neutering dogs. While spaying and neutering is encouraged by dog rescuers worldwide, breeding still remains very popular among canine enthusiasts. 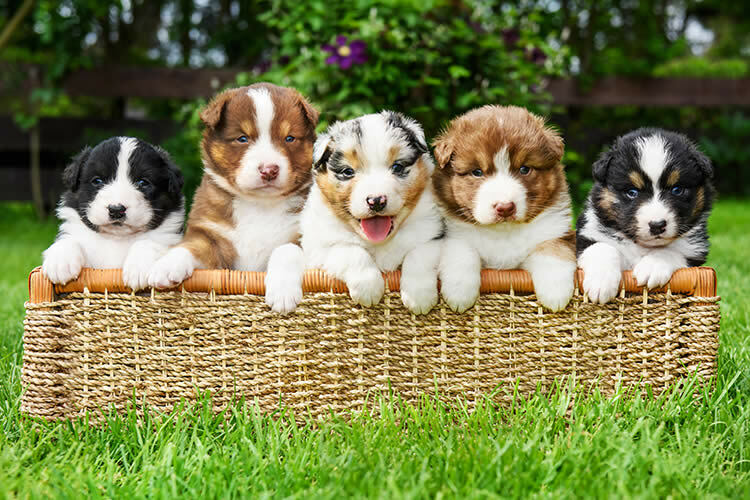 Because superfecundation is so common in dogs, the American Kennel Club now requires specific genetic tests to determine the lineage of a litter of puppies. However, people who are only curious can also purchase genetic tests for their canine kids. Many rescuers foster pregnant dogs, and will continue to care for them long after they have given birth. If you are a good Samaritan who has taken in a pregnant stray dog, try to research online a good local rescue group who can help you with veterinary expenses if you are short on funds. You now know that a runt is most likely to be part of the litter. To give the best advantage to each pup, it is crucial to feed the mother adequate amounts of the proper food for a pregnant or nursing dog. The runt of the litter will be very easy to spot—being the adorably fragile creature who may be half the size of his or her siblings. You must ensure the runt is getting enough nutrition from the mother, even if it means manually placing the pups at different locations on the mom’s belly. Keep the puppies and mother warm, on soft cushions and blankets. Make sure you have puppy formula and bottles on hand, as you may need to step in and feed the puppies manually, especially the runt. Lastly, be aware that puppies who were conceived on the streets do not all survive, but continuous supervision and knowledgeable prevention of problems will maximize the entire litter’s chances of survival, even when superfecundation has occurred. Care2.com: Can a Litter of Puppies Have More Than One Father? The Nest: Can Puppies in the Same Litter Be Different Breeds?